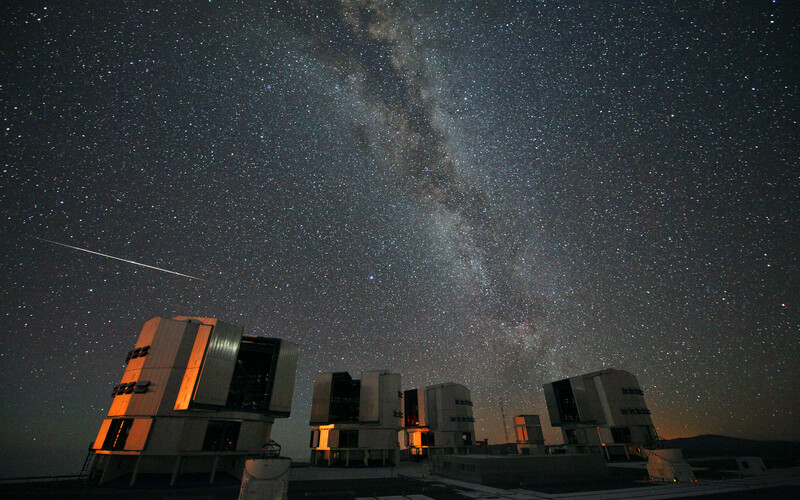 Every year in mid-August the Perseid meteor shower has its peak. Meteors, colloquially known as “shooting stars”, are caused by pieces of cosmic debris entering Earth’s atmosphere at high velocity, leaving a trail of glowing gases. Most of the particles that cause meteors are smaller than a grain of sand and usually disintegrate in the atmosphere, only rarely reaching the Earth’s surface as a meteorite. The Perseid shower takes place as the Earth moves through the stream of debris left behind by Comet Swift-Tuttle. In 2010 the peak was predicted to take place between 12–13 August 2010. Despite the Perseids being best visible in the northern hemisphere, due to the path of Comet Swift-Tuttle's orbit, the shower was also spotted from the exceptionally dark skies over ESO’s Paranal Observatory in Chile. 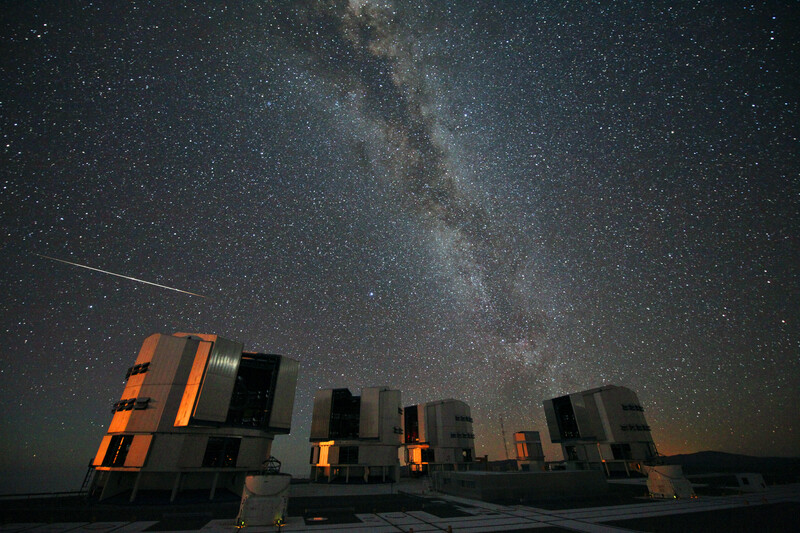 In order not to miss any meteors in the display, ESO Photo Ambassador Stéphane Guisard set up 3 cameras to take continuous time-lapse pictures on the platform of the Very Large Telescope during the nights of 12–13 and 13–14 August 2010. This handpicked photograph, from the night of 13–14 August, was one of Guisard’s 8000 individual exposures and shows one of the brightest meteors captured. The scene is lit by the reddened light of the setting Moon outside the left of the frame. Although the comet debris particles are travelling parallel to each other, the meteors appear to radiate from a spot on the sky in the constellation of Perseus (here seen very low on the horizon and partly covered by the VLT enclosures). This effect is due to perspective, as the parallel tracks seem to converge at a distance. The apparent origin in Perseus is what gives the Perseid meteor shower its name. 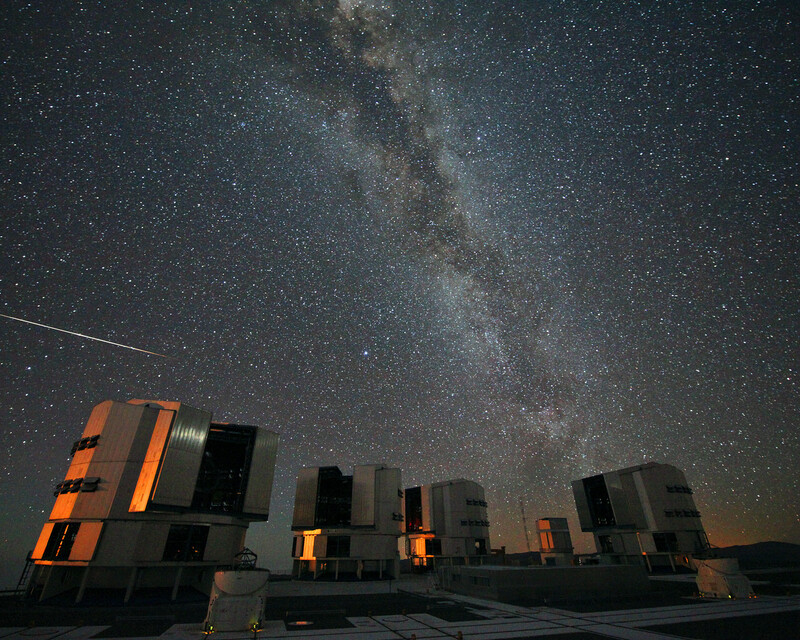 Around the globe, many thousands of people were out observing the Perseids. Some of them took part in citizen science projects such as Meteorwatch and the annual campaign organised by the International Meteor Organization (IMO). According to the IMO measurements, the 2010 Perseid meteor shower was above normal with a peak activity of over 100 meteors per hour under optimal viewing conditions, but not spectacular. In the coming nights the Perseids will still be visible, but with fewer and fewer meteors night by night.